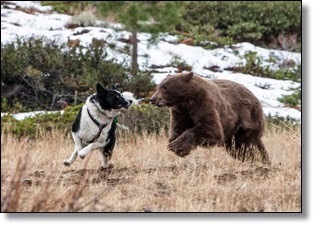 Reno, NV - Rooster, a 10-year-old Karelian Bear Dog, and his daughter 10-month-old daughter, Dazzle play and integral part of the team when it comes to releasing bears captured in populated areas. There travel with their owner, Carl Lackey, a Bear Biologist with the Nevada Department of Wildlife. This includes trucks, ATVs, helicopters, ski lifts, classrooms and everywhere else! 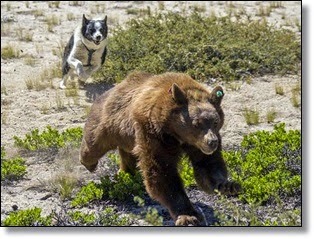 Their main job…to harass the bear by chasing it, barking in its face, and making it run away or climb a tree. Combined with a shotgun firing rubber bullets, the idea is to make the bears not want to return. NDOW has had more success with this procedure than by relocating the bears, many of which return to the capture site within days or weeks if no aversion techniques are used. "They're extremely important to what we do," Lackey said of the dogs. "They're our main tool in non-lethal bear management. Our No. 1 goal is to release bears." Karelians are a specialized breed, originally from Russia and Finland where they were used by grizzly bear and moose hunters. 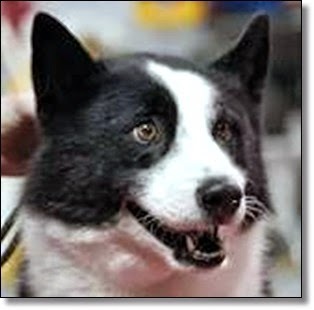 They have a body type similar to a husky and facial features similar to a border collie. Lackey said they also have tremendous instincts and physical attributes. "They're fearless and they're really, really quick," he said, comparing them to a mongoose that is able to keep away from a cobra strike. Lackey bought his first Karelian, Stryker, in 2001 from the Wind River Bear Institute in Florence, Mont., a facility that raises and trains the dogs. Stryker helped with more than 400 bear. Rooster, a son of Stryker, joined the team in 2004, and has helped with more than 300, Lackey said. Now Dazzle is working alongside Rooster. Some of his other offspring is working as bear dogs with wildlife departments in Montana, Alaska and Washington State. Along with chasing the bears during release operations, the dogs can also be used to search under houses when its suspected bears might be trying to hibernate there, tracking, patrolling, finding food attractants and a variety of other duties. Lackey also uses his dogs in schools when he gives presentations. "They're great ambassadors," Lackey said. "The kids love them. They're great family dogs, too." Lackey owns his dogs and provides for their care. He would like to see the bear dog program expanded in Nevada. "We'd like to get one or two more dogs and be able to place them with a warden or two," he said.